information they need to make the claim process go smoothly. We know working with insurance can be a daunting task and often confusing. When faced with filing a property damage claim, don’t be intimidated by your insurance carrier or the adjusters who work on their behalf. We have over 25 years experience and we can walk you through every step of the insurance claim process. We are an independent disaster restoration contractor and hold professional certifications of Master Water Restorer, Master Smoke and Fire Restorer and Master Textile Cleaner. Only a handful of other individuals in the state of Florida can claim this level of certification and training. We are experts at restoration and and can help to ensure your property is restored to pre-loss condition correctly. Learn more about our certifications. 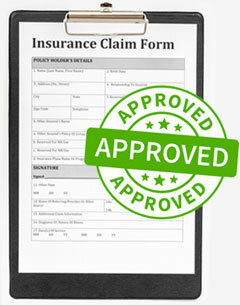 We can bill your insurance company and handle all the necessary paperwork. Our advanced billing software uses report data from our hi-tech equipment monitoring system, virtually eliminating billing errors. Our proprietary software generates unprecedented reports that will document every step of the restoration process, making it easy to provide your insurance company with everything they require. It’s important to have an advocate on your side that understands the technical aspects of restoration, and the complexity of claims. We will work closely with your adjuster and keep them updated with daily reports. We know that proper documentation is extremely important and clears up any questions that might arise later. We use advanced software technology in the documenting process, therefore we can provide in-depth reports that detail everything we do, and then we store the data so it can easily be reviewed even years later. Water damage requires additional documentation. We use a proprietary software system that monitors our test sensors, moisture content, humidity, airflow and more, and then converts the data into easy to read charts and graphs showing the drying progress for each area as well as the entire structure. This advanced technology solution coupled with the science of drying, helps to determine when a structure reaches a dry standard and equipment can be removed. Working with automated equipment means there can be failures and then questions if a unit was performing at the proper levels. We eliminate these questions by using advanced software technology that monitors our equipment and performance levels 24 hrs a day and records the status. In the event of a problem, the system alerts our techs instantly by email, and text message. I have water damage, what should I do first? First is safety because if water comes into contact with electricity it can be deadly. Turn off the power if you can do it safely. Next, turn off the source of the water if possible. Then move contents like books, furniture and other items out of the water. Next call a professional to help. It’s important to report water damage immediately to your insurance agent and they can tell you if your policy covers it. Waiting to report water damage will result in secondary damage so it is important to start mitigating the water immediately. It’s a small leak, should I even contact my insurance agent? A small leak gone undetected can release thousands of gallons over time, and usually it’s not discovered until there has been significant damage. It’s hard to determine how much moisture is behind the walls. One leak behind a toilet can seep through to other rooms, be under carpet or wood flooring. If you aren’t sure how long the leak as been active, call a professional. Should I hire my insurance company’s preferred vendor?